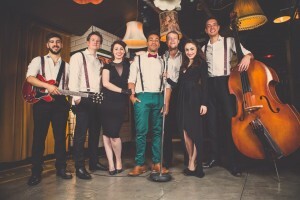 We are proud to have some of the best live Vintage Swing bands and swing singers to hire in the UK here at The Morris Agency. The Swing era, along with Rat pack is an ever-popular band style, and our acts of this type are always in great demand. Those swinging jazz bands are influenced by that nostalgic Prohibition 1920s, 1930s and 40s era and, depending on your needs and preferences, can work from a smaller act all the way to play that impressive “Big Swing Band” sound. We are delighted to offer you our Swing Big Bands, or smaller scaled down versions, tailored to fit your event and giving your party or swinging wedding that classic swinging feel. Just give us a call to discuss what you’re looking for-we’d be very happy to talk to you about your exact requirements. The Morris Agency is one of the UK’s largest live band booking agency with many live party bands and entertainers to hire. Established since 2001, we supply premium live entertainment and music for 1000s of events and occasions per year.We provide you a personal entertainment manager will assist you to choose exactly the right artist for you, and support to respond any questions or queries that you might have. Booking live bands and live entertainment and from The Morris Agency is easy, secure and secure. Each Swing Band booking is secured with a legally binding contract offering you total peace of mind. The Agency individually sees all of the Swing Bands that we take onto our agency and we constantly monitor their performance to guarantee standards are met. When you hire a Swing Band from the agency you area in great hands and make your live entertainment booking experience one to remember.